If you thought you missed out on the free photo purse book from Walgreens, good news! The offer has been extended through Saturday, October 9. To get your free 4.5 x 6″ photo purse book just use the code FOREVER at checkout. You do have to pay $2.99 shipping and handling, but the photo book is normally $6.99, so even with the shipping, it’s a good deal. 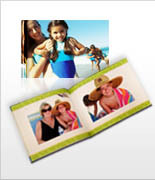 These little photo books are quick to create and make a nice gift for a friend or relative.